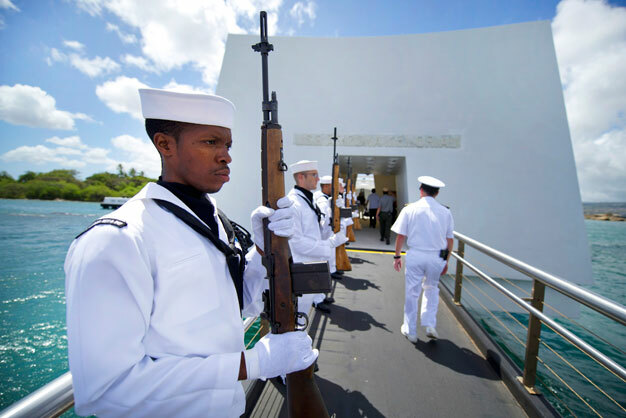 US Navy honor guardsmen stand at attention May 27, 2012, as military and civilian leaders enter the USS Arizona Memorial for the USS Arizona Memorial 50th anniversary commemoration ceremony in Honolulu, Hawaii. The memorial was dedicated on Memorial Day in 1962. Since its construction, the memorial has stood as a place to remember the tragedy, and honor the dead. US Air Force photo by Tech. Sgt. Michael Holzworth.